Northern California will be under a weak high pressure ridge for the next 7 to 10 days. The jetstream will continue to push frontal systems across Canada (see map below). We will continue have sunny skies with a few clouds at times in the far north. Temperatures will be normal of slightly below through Friday and then a few degrees above normal this weekend, with a return to near normal a slightly below next week. Winds will be light nights and mornings and south to southwest in the afternoon. If it wasn't for the smoke we could enjoy the late summer/ early fall weather pattern which will dominate our weather for the next week. High pressure areas will be our east and west with the jetstream running across western Canada (see map below). The next week we will have mostly clear (smoky) skies with a few high clouds. Temperatures will range from a few degrees below normal to just above normal. Winds will be light nights and mornings and southerly in the afternoon. The weather pattern has slightly changed. 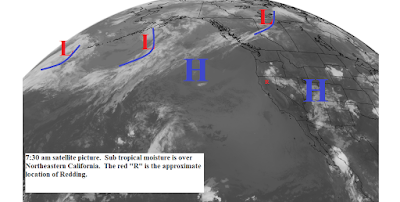 High pressure was directly over the western U.S. and California for much of July and August. However, now high pressure is over the Pacific to our west and over Central and Southern U.S. ( see map below). 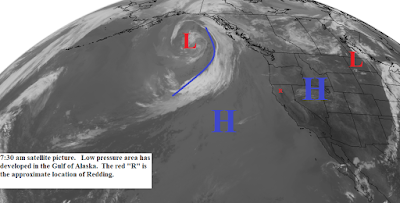 Low pressure troughs are moving through Western Canada. This morning's satellite picture shows one system approaching Canada and the map below shows another system moving through on Thursday. These system could bring a few clouds to the far north end of the state. The nice feature is that for the next week our temperatures will be near or slightly below normal. South to southwest winds are expected in the afternoons. The longer range forecast models keep hinting at a stronger trough along the coast but they keep pushing back its' arrival time. The high pressure ridge continues to slowly weaken and shift eastward. We will transition into a weather pattern like the one shown on the map below by the weekend. 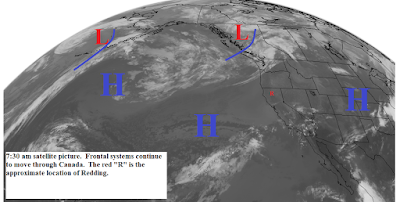 The ridge will have moved eastward as a low pressure trough develops over Western Canada. We may see a few clouds from this system in the far north end of the state on Sunday. Otherwise the next week looks sunny and smoky. Temperatures will be near normal and then cool to below normal by the weekend and early next week. We will have light to moderate south to southwest winds in the afternoons. Longer range forecast models continue show a closed low pressure area off the coast late next week. This could increase our chances of showers or thunderstorms. A weak upper level low pressure area has developed over Oregon and will remain there through late Tuesday. This low could trigger isolated afternoon and evening thunderstorms over Siskiyou and Modoc counties. The rest of the north state will be sunny/smoky today and Tuesday with slightly above normal temperatures. Winds will be south to southwest in the afternoon. The low will lift out late Tuesday and after that we be under a weather pattern like the one shown on the map below. 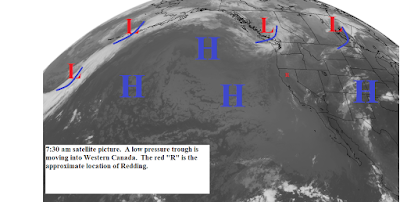 A low pressure trough will be over western Canada and the high pressure area will have been pushed eastward and weakened. Wednesday through the weekend Northern California will be mostly clear/smoky with temperatures cooling to near normal by Thursday and Friday. Smoke will continue to a problem for the next week, especially during the night and morning hours. High pressure is back over the west and today and Sunday will see temperatures 4 to 8 degrees above normal. Winds will be light. Early next week a weak upper level low pressure area will form over Oregon (see map below). This low will remain relatively stationary until late in the week when it moves northeastward. The main affect the low will have on our area is to drop temperatures down to normal or slightly above. Isolated afternoon and evening thunderstorms are possible over Siskiyou and Modoc counties Tuesday and Wednesday. Light to moderate south to southwest winds will occur in the afternoon. The extended forecast still look dry through the end of the month. Late yesterday enough subtropical moisture moved northward to trigger isolated thunderstorms over the higher elevations north and east of the valley. Today there still could be isolated activity over Modoc and eastern Lassen counties. Temperatures today will be normal or slightly above. South winds are expected in the afternoon. The high pressure will rebuild over the western U.S. over the next several days (see map below). This will cause temperatures to warm and by the weekend daytime temperatures will be 6 to 10 degrees above normal. Winds will be south to southwest in the afternoon. A slow cooling trend should start early next week as the high weakens and a weak upper level low pressure area forms off the coast. This low could trigger more thunderstorm activity next week. Once again not much change for the next week. 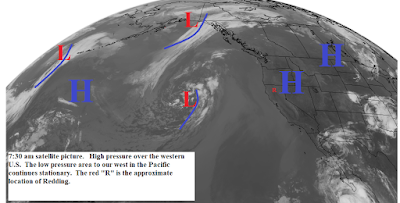 High pressure will remain over the western U.S. (see map below). Skies will be sunny...smoky in some areas...and temperatures will be a few degrees above normal. Winds will be south to southwest in the afternoons. The one feature to watch is the subtropical moisture that has been moving northward. Today through Wednesday there will be afternoon cumulus over the mountains. Tuesday and Wednesday there is a chance of isolated afternoon and evening thunderstorms over the higher elevations north and east of the valley. Long range models show the high pressure ridge holding through the first week of September. They continue to show a shift to a fall like pattern in mid September. The low pressure area that had been stationary to our west is now moving through the Pacific Northwest. The man affect this system will have on our area is some afternoon cumulus over the mountains and gusty southwest to northwest winds in the afternoon. Temperatures today will continue slightly above normal. 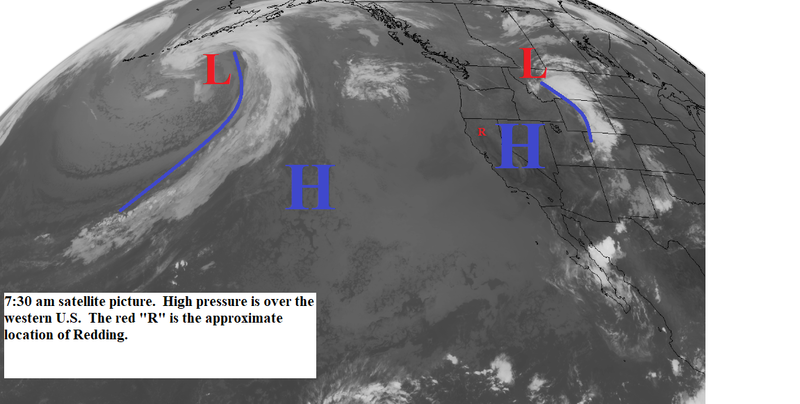 Once the low moves east high pressure will be back in place over the western U.S. (see map below). Sunday and Monday will be mostly sunny (smoky) with slightly above normal temperatures and light winds. Tuesday and Wednesday it looks like some subtropical moisture will get pulled northward over our area. Tuesday there is a chance of afternoon and evening thunderstorms over the Sierras from Mt Lassen southward. Wednesday the thunderstorm threat will be over the higher elevations of all of Northern California. Thursday through next weekend we return to clear skies with above normal temperatures and light winds.